Pat 'Mother Blues' Cohen performing with the Music Maker Blues Revue at Roots N Blues N BBQ 2015. I am a Hurricane Katrina survivor. I worked in New Orleans, and I worked steady so I was familiar with everything there. And then Hurricane Katrina hit. I lived in the Ninth Ward, so as far as physical things I lost everything. Clothes, I had a small sound company so all of my equipment, everything. I had jewelry that people used to give me. I had all sorts of beautiful diamond rings, gold bracelets, diamond bracelets just a lot of really nice stuff, and when Katrina hit it took everything. But those were the things that didn’t bother me as much than me losing a part of my life. All of my gigs, I worked for 13 of the top agencies down there in New Orleans. When Katrina hit I came down to visit my brother, and when I tell you I lost everything, I lost everything. I had a pair of flip-flops and two outfits and I was in an area where I didn’t know anybody so… displaced, that’s what being displaced is all about. Not knowing anybody and not knowing where anything is. So I went down there and I met him and Michael Vaughn, Captain Luke, and Whistlin' Britches (Haskel "Whistin' Britches" Thompson) were there and he actually paid me for that and he paid me good just for coming out and doing a couple tunes with them. I was like 'wow' and I needed it at the time. So I didn’t hear anything else from him for a while and then out of the clear blue one day he called and said "You want to go to Australia? We have a job in Australia.' And that kind of turned my life around because what happened is I met more music maker people. Now everyone is like family, it’s like I’ve known y'all forever, we’re all like family. Just like any other family we have our ups and our downs but we get back together and we’re family, it’s like a big ole family. That is how he helped me, not just by the gigs, but he gave me another musical family. So that within itself, is priceless. 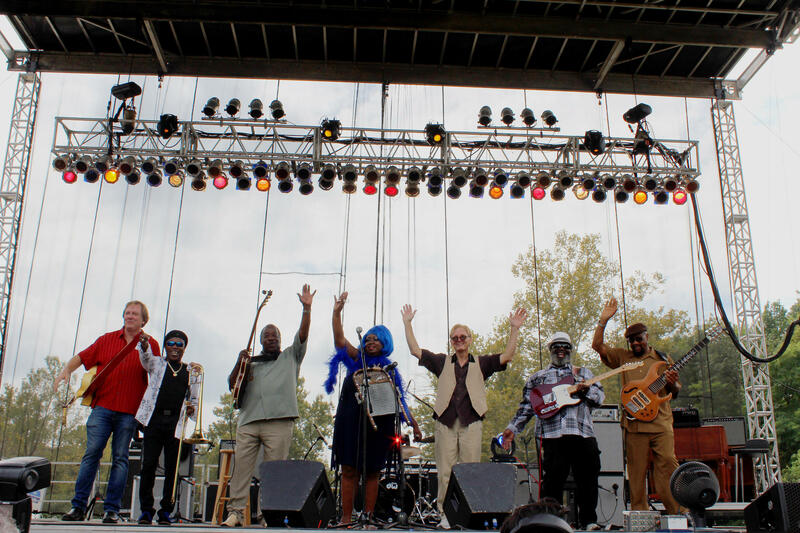 Music Maker Blues Revue onstage at Roots N Blues N BBQ 2015.